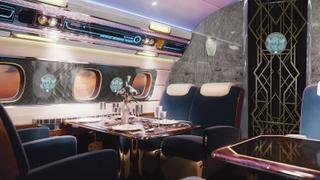 Another concept plane from Embraer is the Manhattan. The Crystal room has an art deco feel. When it comes to creativity, strictly imposed rules and regulations can be somewhat stifling. “There are no rules here; we’re trying to accomplish something,” American inventor Thomas Edison famously said. 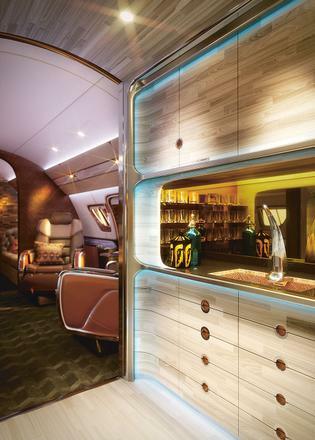 In the world of private aviation, interior designers must comply with the Federal Aviation Administration’s uncompromising requirements regarding the weight and combustibility of materials on board. So how do you create something unique when working within such restrictive boundaries? While most textiles can be treated to meet the requirements, the process can change the characteristics of material, turning silk into something less tactile. “We want the finishes to be in as natural a form as possible, so we need to choose leathers and fabrics we know will retain their original texture and feel after being treated,” says Jim Dixon, head of aviation at Winch Design. When it comes to weight constraints, there are the legal requirements but it also makes sense to reduce bulk as much as possible, saving the owner fuel and enabling them to fly further faster. Attention to detail when it comes to weight consideration is key; an additional fraction of an inch in the thickness of carpet, when used over a large area, can be enough to tip the scale. 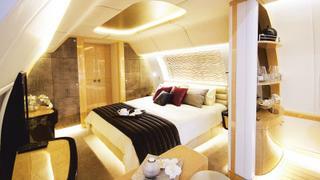 There is the option of applying “faux finishes” – cast polycarbonate mimics the effect of crystal, for instance, and is a fraction of the weight but for the most part, discerning jet owners are looking for the real deal; Greenline recently installed crystal Lalique taps in an airplane bathroom. “Customers appreciate that there are restrictive certification requirements in airplanes but they expect a certain quality of materials and attention to detail in order to create the level of luxury they’re used to,” says Dixon. 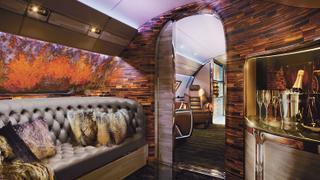 Winch’s recent design of a VVIP Boeing BBJ includes silver-flecked dark veneer panels and buttery soft cream leather seating that features hand-stitched motifs, also embroidered on the valance panels and carpets. The five-seater dining table is finished with shagreen and accessories are made from mother-of-pearl. The intention was to create a scheme that was tactile, elegant and “unapologetically masculine,” says Dixon. Traditional fabrics are undergoing an evolution, too. Leather is no longer simply a necessity to cover unsightly surfaces but is used as a design feature, sometimes woven, embossed or with a metallic finish. There are also leathers that allow cool-air circulation for passengers as seen in the latest sports cars, and leathers being developed that are robust enough for floor coverings. In Embraer’s “Hollywood” concept jet design, an embossed and etched leather side panel creates a raised-relief storytelling mural featuring silver screen starlets, Howard Hughes’s airplane and the iconic 1934 Rolls-Royce. In Skyranch, created by Embraer and Eddie Sotto, leather finishes were inspired by saddles to fit the ranch theme, with layer upon layer of detail and intricate stitching. “These concepts show we can say yes rather than no to our clients, whatever their vision,” says Beever. Innovation is focused on practical solutions over extreme design. So what does the future hold? Embraer is keeping a close eye on the advancement of fibre optic cloth. “There have been examples of fibre optic lighting woven into carpets, but for me the exciting thing is the potential for material to impart information,” says Beever. “All the information that is currently displayed on a small placard stuck on to the seat in front – safety information or instructions for taxi or take-off – could be presented through the material, illuminating when necessary but being invisible at other times.” Thanks to the forward thinking of designers in the sector, regardless of FAA regulations, the sky really is the limit.